With Christmas coming up, and before the tabloids start printing stories about nasty non-Christians conspiring against nativity scenes in shopping centres, I thought I'd write something about Santa Claus. Conservatism favours the restraint of government. A little government and a little luck are necessary in life, but only a fool trusts either of them. Everyone with any sense and experience in life would rather take his fellows one by one than in a crowd. Crowds are noisy, unreasonable and impatient. They can trample you easier than a single person can. And a crowd will never buy you lunch. ... only one firm belief about the American political system... God is a Republican and Santa Claus is a Democrat. He gives everyone everything they want without a thought of a quid pro quo... Santa Claus is preferable to God in every way but one: There is no such thing as Santa Claus. 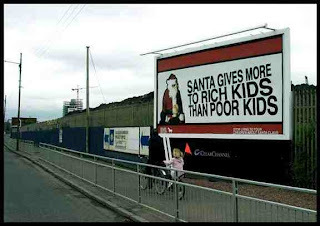 Or rather, Santa Claus seems to have abandoned the ALP. With all this me-tooing and fro-ing, it's nice to hear Kevin Rudd prepared to remind himself of the need not to spend too much of our money. Because let's face it - if Kevin Rudd had spent one cent beyond the $47.4 billion he has committed in election promises since the Federal Budget, many of us could be forgiven for believing that he wasn't exactly the most fiscally conservative chap this side of the North Pole. Liberals (or should that read Conservatives? ), on the other hand, are supposed to be about keeping government's grubby hands out of our pockets and our lives. At least that's the theory. In a desperate attempt to get re-elected, John Howard has thrown conservative political theory (read consensus) off the sleigh for Rudolph to munch on. According to the Australian Financial Review's spendometer, Mr Howard has committed around $62.6 billion since the last budget. Some $9.3 billion of this was spent just in his campaign launch speech. As Laura Tingle notes in the Fin Review on 15 November, that's $667 million per minute. Now feel free to shout from the rooftops those three words beginning with 'W', 'T' and 'F' respectively. Now apparently Santa Claus rewards good kiddies that go to school. But Santa Howard goes further, rewarding their parents as well. Around $6.4 billion in tax breaks is being awarded to parents for school expenses including private school fees and uniform. So if you are one of Howard's battlers sending your child to one of those Struggle Street schools (such as Kings, Sydney Grammar or Wesley College), you can rely on Santa Howard to come to the rescue. And anyone who doesn't like it, even if they be private school principals, can go join Julia Gillard at the Socialist Forum Alumni Collective. To make matters worse, it seems the Coalition has a habit of dishing out the dough in an effort to win the most marginal seats in regional and rural areas. The ALP refuses to scrap the regional grants program. I wonder why. Of course, the ALP are being totally responsible also. Santa Rudd only spent $135 million a minute in his election launch speech. So there you have it, folks. With all this upper-middle class welfare being thrown around by both major parties in the current campaign, many wealthier voters must feel like it's Christmas already! This article was first published in The Drum Unleashed on 16 November 2007.